Black History Month Kicks off in February – Get Ready for African Presence 2019! NSU’s celebration of Black History Month begins on Friday, February 8 with the opening reception of the 16th Annual African Presence Art Exhibition. The event begins at 6:30 pm and will be held in the Rick Case Arena at the Don Taft University Center on the Fort Lauderdale/Davie Campus. 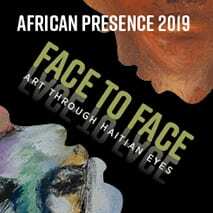 This year’s exhibition, “Face to Face: Art through Haitian Eyes,” features Haitian art, on loan from, and curated by the NSU Art Museum Fort Lauderdale. The exhibition will be open Feb. 8 through March 3 in the Cotilla Gallery, Alvin Sherman Library. During the reception, we will highlight the power of service and community as we recognize the works of the Urban League of Broward County. Additionally, we will honor black Greek organizations, including NSU’s undergraduate chapters, for their contributions to the communities they serve. The evening includes refreshments, giveaways, musical entertainment by NSU’s Riff Tides acapella group, guest performers and more. The reception culminates with the viewing of the exhibition in the gallery. Space is limited. To RSVP for the Opening Reception, click here or call 954-262-5357.